FILE - A boy carries a jerrycan in the drought-hit Baligubadle village near Hargeisa, the capital city of Somaliland, in this handout photo provided by The International Federation of Red Cross and Red Crescent Societies, March 15, 2017. Somaliland authorities say famine looms in the breakaway republic as the government suspends development programs due to a crippling drought that has killed dozens of people and most of the livestock in eastern regions. Speaking to VOA in Hargeisa, Somaliland Vice President Abdirahman Abdullahi Seylici says drought conditions look set to deteriorate further with an increasing risk of famine. Seylici says Somaliland has few resources to cope with the drought, which has severely affected the economy. He says officials decided to suspend the development programs in order to control their budget and be ready if the drought crisis worsens. “So we decided to divert money to emergency, live-saving and drought-response efforts,” he added. 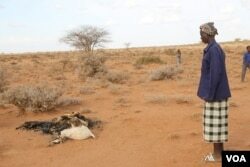 In Somaliland, nomadic communities across the region say they have never experienced this kind of drought. Seylici told VOA he can only confirm that more than 10 people died of starvation across Somaliland, a lower number than previously stated by other Somaliland officials. The United Nations Children’s Fund said Friday more children are alarmingly at risk as Somalia faces severe drought and starvation. FILE - Children drink water delivered by a truck in the drought stricken Baligubadle village near Hargeisa, the capital city of Somaliland, in this handout picture provided by The International Federation of Red Cross and Red Crescent Societies on March 15, 2017. Reports from eastern regions of Somaliland say cholera is spreading as people affected by drought have been forced to drink dirty water from dried-up wells. The United Nations says more than 6 million Somalis need emergency food, including close to 1 million acutely malnourished children.